Like many dads, Hank Erwin used to tell his sons Andy and Jon bedtime stories. True stories. One in particular that they loved was about a high school football team in the midst of crisis, until a supernatural event transformed the team, the community, the state. Now, that very bedtime story their dad told them the Erwin brothers will retell to everyone on the big screen as the major motion picture Woodlawn debuts in theaters on Friday, October 16. 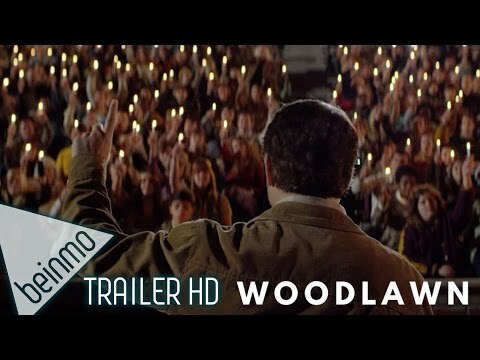 Woodlawn recaptures the events from 40 years ago, as a high school football team at a school in danger of being closed comes to grips with their personal problems and resolves to come together for each other and for a greater vision. In many ways, the film is a historical mirror whose reflection looks very much like today. People are becoming weary and are losing heart. The country is divided on racial, religious, and political lines. The younger generation is rebelling against the cultural emptiness of their parents, yet they don’t know what to believe themselves. The times have created a vacuum that can only be filled with supernatural hope. If there was ever a need for personal and national revival, it would be now. In 1970, racial rioting, jaded views of politics, and disrespect for traditional authority were often in the headlines. Hope of change seemed more bleak by the day. But a revival was coming, and it showed up prominently in the most unexpected place. A high school football field in Birmingham, Alabama. Part of the cultural revolution that occurred in the late 1960s and early 1970s was a dramatic growth in Christianity. The same Time magazine that ran a 1966 cover asking “Is God Dead?” ran another cover story in 1971 on “The Jesus Revolution.” And just one year later, more than 80,000 high school and college students gathered in the Cotton Bowl Stadium in Dallas for Explo ’72, organized by Campus Crusade for Christ (now known as Cru) to celebrate the person of Christ and mobilize youth to take the Good News to friends and family when they returned to their hometowns. One of those hometowns was Birmingham, Alabama, one of the most segregated cities in America, and the scene of bloody racial attacks in the early 1960s. Ten years later, racial tension was still high as the last of the city’s high schools were integrated. And that’s where the movie Woodlawn starts. As the film begins, the Woodlawn football team is in turmoil. Because of racial tensions and other interpersonal strife, they can’t get along, much less function on the field. A local homebuilder comes to the coach, telling him he knows what’s missing — something he had found at Explo 72. He asks for just five minutes to speak to the team. He ends up speaking for an hour about the life-changing power of Christ. He asks the players if they’re tired of the bitterness and animosity and want to make a change, then invites any player to come down off the bleachers and give his life to Christ. One by one they come, until the whole team is standing together. It is a turning point for the team, the school, and the city that’s only 10 years removed from the tragic bombing of the black church that claimed the lives of four little girls. The central focus of the movie is Tony Nathan, a gifted but untested black player who is not even sure his teammates want him there. Even though the coaches know that giving their black athletes playing time will stir tension among the predominately white student body, they do it anyway. Tony is such a standout player that, in no time, he unifies the students and community around Woodlawn football. At the same time, the spiritual revival that had begun with the team begins to spread through the school. As the team gels, their performance on the field gets noticed. They’re not just good because they have a top-tier player in Tony. They’re good because they’re playing for each other, and for the glory of God. Woodlawn football is not just about winning, but about winning hearts and souls. Over the course of the film, we see this spiritual and community revival spread to other teams in the city, including archrival Banks High School, who Woodlawn eventually plays for the championship. Without giving too much of the story away, community revival and great football put the 1974 Woodlawn-Banks game, played at Legion field before 42,000, in the Alabama high school football record books to this day. And each team furnished a key player — one black, one white — to the University of Alabama football team which would go on to win the 1979 NCAA championship. Woodlawn is a very personal project for the Erwin brothers (October Baby, Mom’s Night Out). They recognize that our current culture is yearning for the hope that emanates from Woodlawn’s story of redemption and reconciliation. The film was already in production in 2014 when racial unrest broke out in Ferguson, Missouri in the wake of the Michael Brown shooting. The Erwins were editing the film when Baltimore was thrust into chaos from racial tension. And they were in post-production when Charleston, South Carolina experienced the worst church violence since the 1963 bombing of 16th Street Baptist in Birmingham. As they spoke with producer Michael Catt (who was also behind Courageous and Fireproof) all agreed that God must have prompted the making of Woodlawn for such a time as this. It’s also probably no coincidence that Woodlawn’s October 16 release is just two months after War Room, a movie calling Christians back to prayer. Jon Erwin points out that each of the three great revivals in our nation—the last one being the Jesus Movement of the 1960s and 1970s—were preceded by prayer. War Room was one of the top three most popular films in the nation over its first three weeks, and countless people who have seen the film have committed to be more intentional about prayer. Aside from their desire to foster racial reconciliation, the Erwins are trying to recapture the youth generation, 70 percent leaves church after high school. These are the same young adults who buy more than two-thirds of the movie tickets sold in the U.S. each year. “It almost makes me angry that I haven’t experienced something like that in my time and my generation. That’s the reason we’re doing Woodlawn,” said John Erwin. “Film is an emotional experience. It’s a way you can taste something that you’ve never experienced before in your life. And it’s a way for a generation to taste just a little bit of what revival, spiritual awakening, whatever you want to call it, is like. And my prayer is that by going to a football movie they get a taste of revival and awakening and they begin to crave it for themselves. I feel like it’s coming.”At $22 million, Woodlawn is the highest budgeted independent Christian film in a decade. Much of that is being sunk into publicity and getting the film in as many theaters as possible. It will debut on almost twice as many screens as War Room. But the money also went to securing talented, big-name actors that give the film credibility among a non-Christian audience. Sean Astin (Lord of the Rings, Rudy) plays the role of Hank, the team chaplain. Bear Bryant is masterfully portrayed by Academy Award winner Jon Voight (Coming Home, Deliverance). The actor who portrays main character Tony Nathan is a newcomer to film, but his name is probably familiar to football fans. Caleb Castille won two national championship rings with the University of Alabama before he sensed God was calling him out of football to pursue acting. His father, Jeremiah Castille, played with Nathan and Banks quarterback Jeff Rutledge on the 1979 Crimson Tide national championship team. Caleb was originally hired as a stunt double for the British actor who was picked to play Tony, but visa complications left the Erwins in a lurch. Only then did they discover Caleb’s audition tape and realize that their “Tony Nathan” was right there in Alabama, and as much a product of the Woodlawn story as they were. Woodlawn’s great acting, outstanding production quality and poignant story line together make it a movie well worth seeing and encouraging friends to see. It’s a great film about football and the power of reconciliation, but it also is a vehicle for presenting the gospel naturally to those who mistakenly believe it has no relevance in their lives. This post was adapted from the original article which appeared in The Family Room, the bi-monthly e-magazine from FamilyLife. © 2015 by FamilyLife. All rights reserved. You just finished reading “Woodlawn: The power of reconciliation” on the Stepping Up blog for men. Jon Erwin and Andy Erwin discuss the mission of previous movies October Baby, Mom’s Night on FamilyLife Today. Let Jon Erwin tell you their dream about reaching the world for Christ through the medium of film. Go to the official Woodlawn movie website for more video features, theater locations and to buy tickets.